Are you a new resident planning on moving to Dunwoody Ridge? Direct links are provided on this page to help you set up everything you need to get ready to move to your new Home! Georgia Power will be your electric company, and call the office to get some recommendations with your renter’s insurance. Apartments are pre-wired for Comcast, yet you are able to choose any provider that can verify service to you. To connect Comcast, please contact 1-800-266-2278. Ever wonder what’s going on around Dunwoody & Sandy Springs? Well look no further, we have done the looking for you! Below you will find helpful links to everything Dunwoody & Sandy Springs! If you would like a link added, don’t hesitate to shoot us an email or give us a call! We are so delighted to have such wonderful residents at Dunwoody Ridge!! 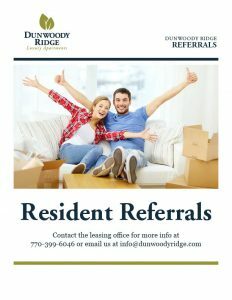 We would rather reward you, more than anyone else, with a cash bonus for referring your friends and family to Dunwoody Ridge!